Foods & Specialty Meats | Abbyland Foods, Inc.
Abbyland Foods, Inc. is a modern facility with three unique processing areas. The newest contains our continuous ovens with three lines with the capacity to manufacture between 1,280,000 and 1,760,000 pounds per week depending on the product mix. The fresh and smoke sausage kitchens have sixteen processing lines with a capacity of 2,000,000 pounds per week. In addition to our sausage capacity at Abbyland Foods, we have a hot stuff line at Abbyland Pork that can run 1,500,000 pounds of pork chubs or slicing logs per week. We manufacture special recipes for many of our customers. Abbyland has a flexible approach to processing and is willing to take a look at any project. If you need a product that is not on the list, please let us know. We would be interested in developing something for you. 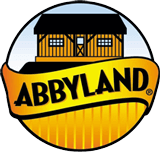 Abbyland, Inc. is headquartered in Abbotsford, WI. We are always proud to show off our operation. If you would be interested in a tour of our plants, we would be be more than happy to make a plant tour as part of our negotiation talks to produce any part of your product line. Please give us a call or email us your questions or concerns. We will be glad to set up an appointment. Let us show you what Abbyland is all about! Oven Type A variable temperature/high temperature spiral oven—direct fired. Capacity 6,000 – 8,000 lbs per hour depending on product thickness. Precook Products Pizza toppings, taco meats, loafs, ribs, patties, burgers, breakfast links, dinner links, precooked brats. Oven Type A variable temperature air impingement oven—indirect gas fired oven. Capacity 6,000 – 8,000 lbs. per hour depending on product thickness. Packaging Horizontal form fill seal capabilities; vacuum skin packs, gas flush pillow packs, printed film (skin or pillow)—gas flush—frozen or refrigerated. Oven Type An infrared oven—direct fired.